Sonos reportedly planning high-end wireless headphones | What Hi-Fi? Well, here's an interesting development. Sonos, the wireless multi-room speaker specialist, is said to be planning a move into a whole new product category: headphones. Bloomberg reports Sonos is planning to launch a pair of "high-end headphones" to take on the likes of Bose, Sennheiser and Sony. According to people familiar with the plans, the Sonos headphones would be wireless, feature an over-ear design and land with a price tag of at least $300. That price certainly sounds about right for premium wireless headphones and would see Sonos take on some strong rivals, such as the Sony WH-1000XM3 and B&W PX. 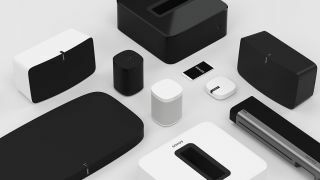 The report suggests Sonos will focus on sound quality while also ensuring they work with multiple digital assistants, as is the case with its connected speakers, such as the Sonos One. Presumably they would also form part of your Sonos system when listening at home. The company is reportedly approaching manufacturers outside the US to produce the headphones. It's certainly not a move we saw coming. Sonos announced the Sonos Amp towards the end of 2018 and rumours circulated this year about an update to the Sonos Play:3, but Sonos wireless headphones is certainly a curveball.